Greenville, VA is a small town that puts a lot of value on social responsibility and hard work. At Staunton Tree Service, we think we stand by those values as well. You take good care of your homes, so why would you trust your trees and yard to a company that doesn’t stand by their work? 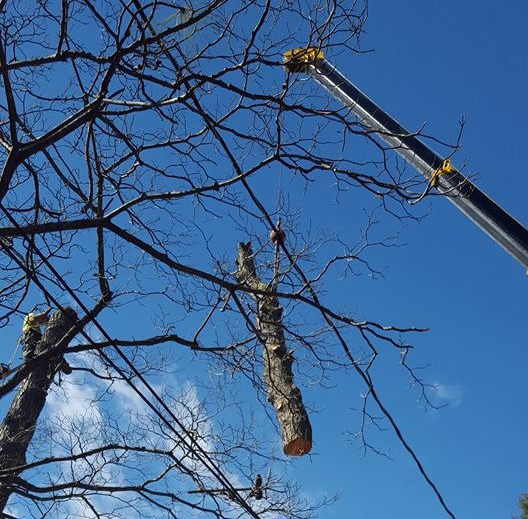 Use the form below to request a free estimate on your tree service needs in Greenville, VA.
Tree removal in Greenville can be a little tricky because of space, but that doesn’t mean it is impossible for a team that has the equipment and the skills. Tree removal is dangerous, however, and it has to be left up to the professionals. From piecing down the tree to removing every leaf, twig, and branch that we put in your yard, our team provides you with a high quality experience. We can even advise as to whether or not a tree needs to be removed. Call us today and we will be able to give you a quote for tree removal – from one tree to a whole piece of land. Tree trimming and pruning is something that many homeowners think they can do by themselves. However, that really isn’t the case. In order to be effective with your tree trimming and pruning, you have to have the education and training to be of benefit. At Staunton Tree Service, we know all about tree trimming and pruning – for trees that you normally see to more exotic trees that were imported here. After a tree is removed, there is typically a leftover marking that reminds you of where it stood – and that stump can be a really big annoyance. From getting in the way of hardscaping and landscaping to being annoying when you have to mow your lawn, you should probably try to eliminate it. Not only that, but whatever killed your tree still lurks in its stump. Stump removal should be left up to the professionals to prevent damage to yourself or your yard. Call us today for an estimate or ask for one when we remove your tree. Your trees appear healthy, so that means you don’t have to do anything, right? Wrong. There are a ton of different things that could go wrong with your trees that don’t have obvious physical markings until it is too late. Getting a tree health screening is the best way to find out about those problems. At Staunton Tree Care, we have the equipment and eye for details that keeps your trees healthy for a long time. Greenville sees some pretty intense storms, but they are nothing compared to the cleanup afterward. From trees that fell clean from the root to branches everywhere, you shouldn’t have to worry about that cleanup. Staunton Tree Service has the tools, trucks, and team members to help clean up after storms that leave your yard a mess. Give us a call today to get an estimate for our services. Greenville is a reputable town that cares about appearances and tree care. This is an admirable quality and we hope to continue spreading that to the surrounding towns. Staunton Tree Service is equipped with the tools and insurances to handle all of Greenville, including businesses.